I took several vitamins just now, and one appears to be like stuck on the way down. It's incredibly annoying actually. Had a dream that I was in Italy again, but it was snow there - and friends of mine were plotting vengeance to some other guy and schemed me in on it. Then I had legs made of glass, and had to watch some weird movie about matches and a love relationship between the Chinese Emperor and his Japanese sister in law. In addition I was also very fat and had to swim a small girl to safety from angry, yappy little guard dogs. And in the house I dreamt I was in there were these big, beautiful, blinking and coloured glass chandeliers. My oh my. But really this is nothing. 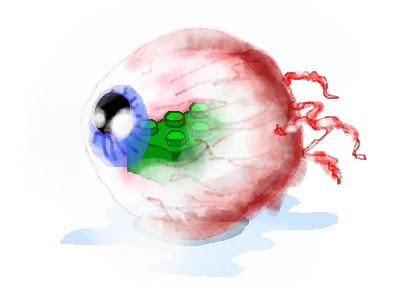 Because last night I dreamt I had a bit of LEGO inside my eye, like INSIDE. So I took my own eye out of its socket and put it in a jar of picklejuice because treating your eye like it's a gherkin preserves it better. I don't know. Confusing. But today it is friday and everyone will be twice as happy as usual. Unless they have miserable plans for the weekend of course. Soon Elin will come back from Bali, we'll get a new dog(!) and then it'll be summer! Wow!